Every author wants their book to succeed. Some authors focus so much on writing, though, that they never learn how to make their message work for them. I’m NOT saying that the goal of writing is to get rich. However, if your writing doesn’t become financially self-sustaining, then your influence will be brief. I know authors who wrote great books, but they were forced to quit due to a lack of income. So, use this article to consider if you’re causing your message to shrink or spread like wildfire. Poor Authors think they only need a Good Book. Rich Authors know they need a Good Marketing Plan. Poor authors hope if they write a great book, then it will automatically sell itself. However, this notion is unrealistic when you’re competing with over 100,000 other “great” books published each year. Good writing alone can’t always cut through the noise. Plus, poor authors assume their publisher will do all of the marketing. Yet, cash-strapped publishers usually restrict most of their marketing budgets to the big names. Rich authors don’t just write good books. They build a good marketing plan around their book to help generate sales. Publishers love authors who clearly define their audience, differentiate their book from the competition, and develop creative ways to promote their message. 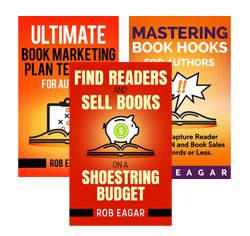 Click here for a marketing plan template designed specifically for authors. Poor Authors expect Income only from their Book. Rich Authors expect Income mostly from Spin-off Products. Poor authors try to pay their bills by writing as many books as possible. They live off of advances and dream of royalty checks. Yet, few writers can make it on a $1.00 royalty. Sadly, this one-dimensional mindset blinds them to other streams of income. Some authors even think the best way to sell a book is to quickly write another book. Rich authors realize their book is a pathway to more lucrative opportunities called spin-off products. For example, I used content from my $10 book to create a $150 video study. Remember that people like to learn in varied ways. So, if you limit your message to just a book, then you will limit your income and influence. But, if you focus on meeting the needs of your audience, then the offshoot potential is endless. You could offer speaking seminars, videos, downloads, e-books, audio, coaching sessions, paid newsletters, etc. Ask yourself right now, what new spin-off products could you create from your book? Poor Authors rely only on Publicity. Rich Authors rely on Exposure they can Control. Poor authors rely on publicity to promote their books, such as media interviews, book reviews, and book-signings. Yet, publicity is something you cannot control, because you can’t force someone interview you, review your book, or attend a signing. Worse, competition is fierce for bookstore shelf space and available media slots. In these situations, you’re just one among thousands. Rich authors still use publicity, but they find ways to market their book as the only choice in front of the buyer. They get exposure that they can control. For instance, when someone reads your newsletter, you’re the only buying option at that time. Good exposure keeps customers focused on your book. You could submit articles to magazines, create an audience-focused website, setup tele-seminars, generate speaking engagements, do your own radio show, create a print or e-newsletter, etc. Don’t let your book sit in the poor house. Think like a “rich” author and make it go to work for you.